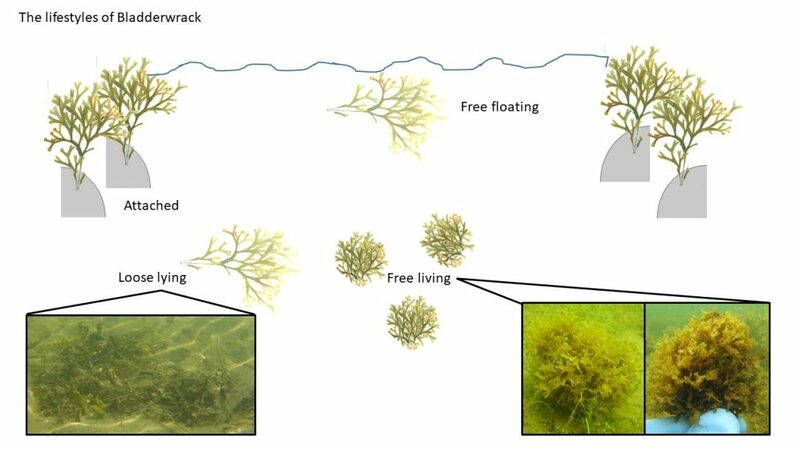 The curious case of free-living Fucus: what is it and where does it come from? Bladderwrack (Fucus vesiculosus) is a brown algae commonly found within many parts of the Baltic Sea. It forms structurally complex habitats at depths of 0.5-7m, providing shelter and food for many marine invertebrates and fish. It is one of the major foundation species in the Baltic Sea coastal zone. Generally, bladderwrack is considered a rocky shore organism, being most notability found growing attached to rocks, boulders and pebbles. However, interestingly an unattached form can also be found. These unattached individuals form free-living populations, that can be quite extensive (10-100m2) occurring year after year at the same sites. They have been observed since the late 19th century (Kjellman, 1890) and are generally described as pieces torn from attached populations and deposited in sheltered locations, with no ecological significance. However with modern molecular techniques; including microsatellites and DNA barcoding; we aim to test this theory. Firstly we aim to test this long held idea that the free-living populations are solely supplied by the surrounding attached populations. To put it simply, do they rely on supplies of torn off pieces to start and replenish a population or are they fully or partially self-sustaining through their own means? This really is a question of ‘can they reproduce?’, and if so ‘how do they do it?’. We surmise that the founding members of any free-living population are supplied by pieces from attached populations, as has been suggested since their first documentation. However this is where the ideas diverge, rather than assuming any replenishment to the population are from supplies of material from the nearby attached population, we view that these free-living populations have some level of self-sustainability. How do they do this? The current idea is through fragmentation, a method of asexual reproduction where new, smaller, genetically identical individuals are formed through breakage from the main individual. If you ever get your hands on a free-living bladderwrack individual, you will see how easily one individual becomes many with just the simplest of handling. Through splitting into many individuals that continue to grow and eventually break apart once more, soft bottoms can quickly become dominated by many genetically identical plants. The level at which this asexual reproduction occurs will be defined by the amount of genetic variation within the population. If populations contain only a few genetically different individuals then we can assume that fragmentation plays a large role in maintaining these free-living populations. If we observe the reverse; many genetically different individuals; then it is likely that either attached populations are largely responsible for supplying these populations, or that the free-living plants can themselves reproduce sexually. The latter seems improbable, in part because few free-living individuals have been observed to form sexual structures known as receptacles. 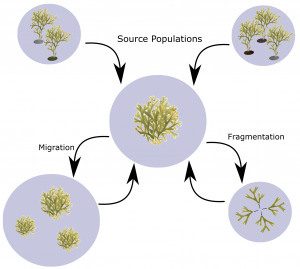 Now that we have established the possible mechanisms for forming, maintaining and regenerating free-living populations, we can consider the dispersal of a normally immobile seaweed. It is frequently observed that broken off pieces from attached individuals can be transported by currents over great distances; and since reattachment is incredibly rare; either these free-floating pieces eventually sink becoming loose-lying pieces which eventually decay or they contribute material to free-living populations. However the question is, are free-living individuals equally as mobile? Can free-living individuals migrate between patches, and do distances and other abiotic factors affect their dispersal? We currently have little idea as to answering this question, but it seems likely that distance and geological features will be the major influences on the dispersal potential. By identifying the genetic variation; or the level of relatedness; between and among populations we will hope to answer this intriguing question. Thirdly, we have little idea of the importance of free-living populations. What function and ecosystem services do they provide in the coastal zone? 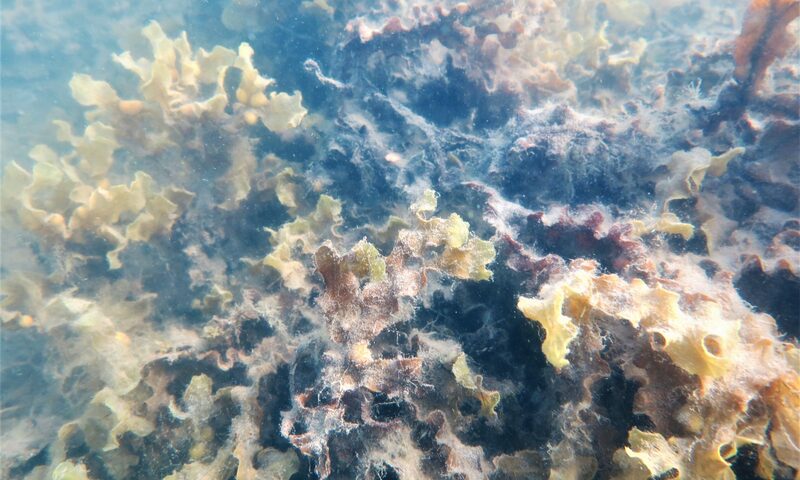 Through inhabiting soft bottoms, that are normally uninhabitable by the attached form of bladderwrack, they can provide a complex habitat that would normally not be found on this substrate type. Consequently this habitat can support a vast variety of plants and animals that would otherwise not be found in that location. Through environmental surveys and the monitoring of biological measurements we aim to identify the important functions and services that are provided by the free-living populations. Now comes the most important question: Why do we need to study these questions in the first place? As an integral part of the Baltic Sea ecosystem, free-living bladderwrack is considered an important biotope at risk of damage. As such they are listed on HELCOM Red List of biotopes and habitats as endangered (HELCOM, 2013). This means that policy makers and conservationists need to implement methods to best protect these populations. Without adequate knowledge, including the genetic diversity, of these populations successful management is doubtful. As such, if we wish to maintain the health of these populations and consequently that of the Baltic Sea, we need all the research we can collect. 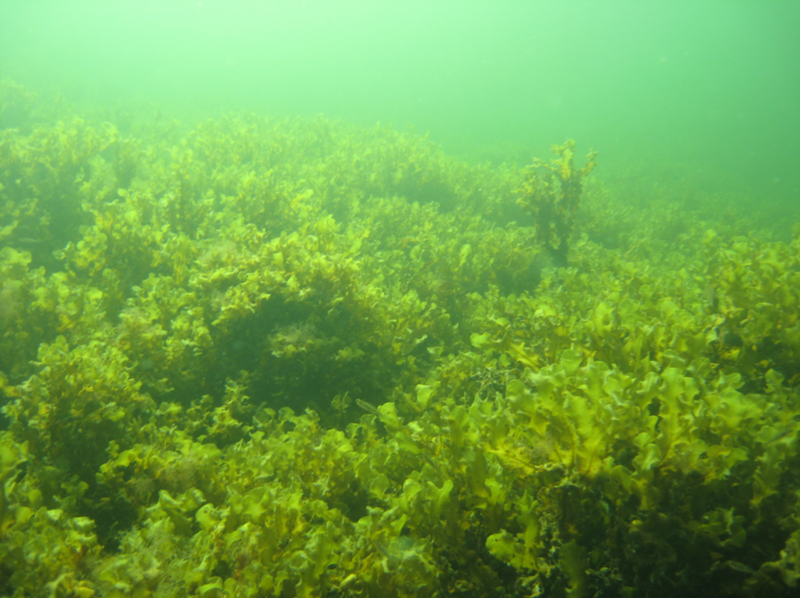 HELCOM (2013) Red List of Baltic Sea underwater biotopes, habitats and biotope complexes. Baltic Sea Environmental Proceedings No. 138.